Who is God? Who is He? We know all the right words to say – but do we believe those words? Do we liveas if we believe those words? Do we live as if He is everything – everything we have ever wanted, everything we will ever need? As we study God’s word we read scripture after scripture about who He is. Yet, still we search for something more. We do, don’t we? We think we need something more than Him. Our flesh longs for a mate, a family, approval of others, a career, a home, a feeling, security, confidence. But like the old song says, we are looking for love in all the wrong places. Does this resonate with you? Have you ever caught yourself searching for what you already have? I have – like my sunglasses when they are on top of my head, my cell phone when it is in my hand, and unconditional love and acceptance when God has already given it to me. Why are you searching for more? 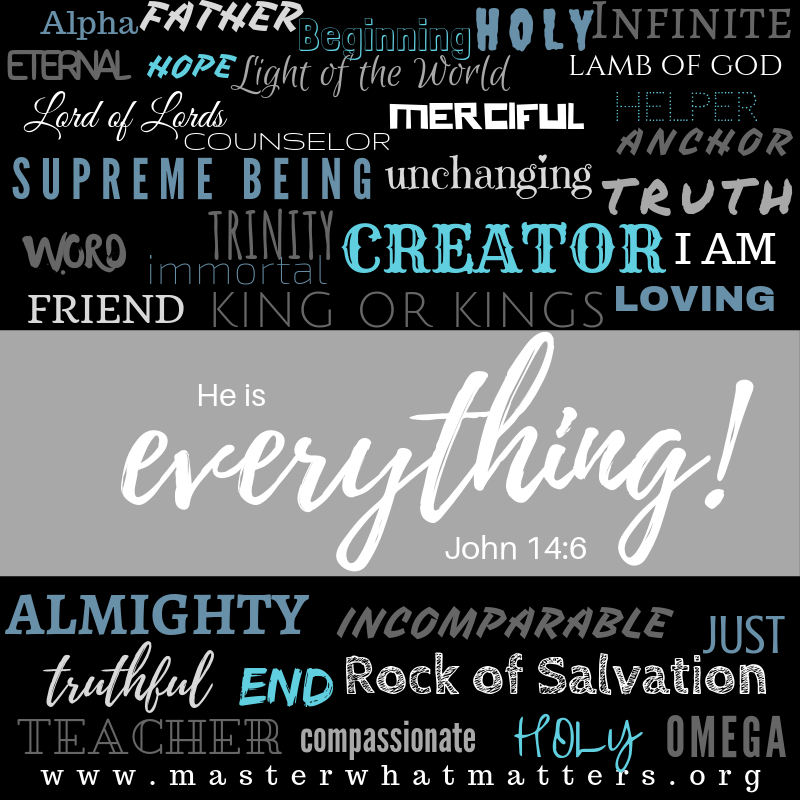 Today – can we all just stop and read through the words on the graphic and praise His Holy Name for who He is, all He has done, and all that He is doing!! Can we raise a hallelujah for the One True God? Can we thank Him for His mercy and His grace, and for His unconditional and everlasting love? He is Everything!!! Let’s praise Him all day today!